Despite the significant uptick in the number of Proptech investment deals, global investment in real estate technology declined to $9.6 billion experiencing a 23.7% year-over-year drop in total volume last year. The average amount invested declined by nearly 32% to $25 billion from $36.3 billion in 2017, according to the 2018 year-end PropTech funding report published by CREtech, a U.S.-based commercial real estate technology event and research platform. Total deals grew significantly by nearly 47% to 509 from 347 in 2017, and seed funding deals outnumbered series A transactions by a 3:1 ratio- as expected, the majority of the cash, nearly $6.14 billion, was consumed by series A funding rounds. The most significant quarterly year-over-year drop was observed in the fourth quarter of last year when investment declined by 37% to $4.1 billion from $6.5 billion in 2017, after a promising third quarter when funding soared 50% to $4.5 billion compared to $2.9 billion. Co-working behemoth WeWork and consumer-based real estate services providers China-based Lianjia, Opendoor and Compass received the bulk of funding dollars nearly $5.8 billion from private equity and late stage funding rounds. 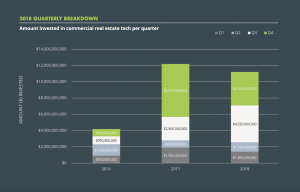 The venture capital market in real estate tech is starting to show signs of tightening according to Ashkan Zandieh, chief research advisor at CREtech, who observed “remarkable growth in dollar volume has led to the late-stage deal market looming large over the greater venture capital landscape,” which was demonstrated by later-stage rounds accounting for 91% of dollar volume in 2018. Zandieh, who has spent the past five years growing RE: Tech a PropTech research and advocacy organization acquired by CREtech last month added, “This isn’t a scenario where in a high tide all ships rise” emphasizing that as late-stage activity intensifies globally it’s likely to squeeze other stages toward the margins. Factors causing the squeeze include fewer private equity deals with previously venture-backed companies and angels, seed, and Series A investors accounting for less total dollar volume over time.